A trademark application filed in the European Union suggests Samsung is planning further AI-based optimization of games on, possibly, the Galaxy S10 and other devices. When Samsung launched the Galaxy Note 9, it added several AI-based features, such as game optimization. With the arrival of the next generation hardware, the company is set to develop this further, as the Exynos 9820 launch emphasized its massively improved NPU (Neural Processing Unit). A new European trademark application adds fuel to that fire. Yesterday, Samsung filed paperwork for protection of the name Neuro Game Booster. 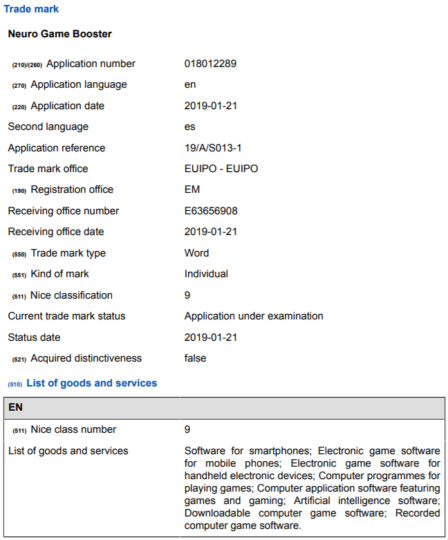 The trademark’s description makes very clear we are looking at: ‘Software for smartphones; … Computer application software featuring games and gaming; Artificial intelligence software.‘ Though this application was filed with the European Union Intellectual Property Office, we expected the same trademark to surface in other parts of the world in the coming days or weeks. Samsung has not yet used the term to refer to any of its existing AI-optimization efforts. The timing of the new application, therefore, suggests we could see a Neuro Game Booster make its debut on February 20, at the launch of the Galaxy S10. However, let us not forget there are more devices on their way to launch in the first half of 2019. For example, the upcoming Galaxy A50 is expected to pack the Exynos 9610 soc. This chip, too, was launched with an emphasis on an improved NPU. Perhaps, therefore, Neuro Game Booster will not merely be a neat bit of marketing speak that accompanies the new flagship devices, but an AI-application to be found on a broader range of phones and tablets with hardware powerful enough to handle serious gaming.